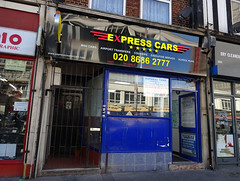 Minicab firm on the High Street. As of December 2017, the frontage also advertises computer, laptop, and mobile phone repairs, as well as an internet cafe. Last edited 2019-02-07 15:28:35 (version 37; diff). List all versions. Page last edited 2019-02-07 15:28:35 (version 37).